Tooth sensitivity is a relatively common side effect of teeth whitening. 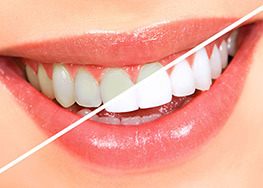 If sensitivity occurs, it is often temporary and will go away once you’ve completed the whitening process. Our whitening gels include desensitizing ingredients like potassium nitrate and fluoride to help reduce sensitivity and provide additional comfort. Our whitening gels include potassium nitrate and fluoride. Potassium nitrate has been shown to help reduce sensitivity. Fluoride has been shown to help reduce caries and strengthen enamel.